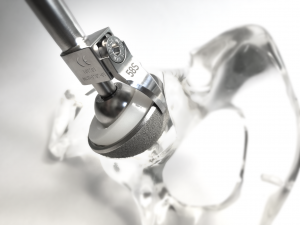 Spierings Orthopaedics has recently developed a new product, the Noviomagus Cup Resector. The Noviomagus Cup Resector is designed to remove uncemented acetabular cups in a safe and effective way. The resector minimizes acetabular bone loss at the bone-prosthesis interface during cup removal. The Noviomagus Cup Resector comprises a shaft, wrench, head, bolt and a blade. The Instrument is made of high quality stainless steel which makes it an extremely durable device. – Minimal acetabular bone loss. – Reusable, hardened stainless steel blades. – Wrench with a robust grip, which can be placed in six different positions. – Eight sizes of starter and finisher blades, ranging from 46 to 60 mm with 2 mm increments. – Three sizes of centering heads: ø28 mm, ø32 mm and ø36 mm.